It was exactly 4 years to date yesterday since Qatar was chosen to host the 2022 World Cup. In the meantime heavy accusations over labour slavery and corruption shook the hosts in international media, but still left room for celebration, especially after FIFA announced FIFA was innocent of corruption. 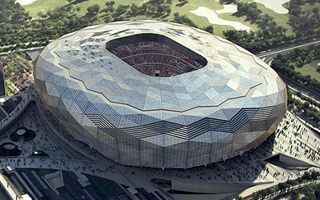 So the Qatari Supreme Committee celebrated with the release of fourth officially approved stadium design: the Qatar Foundation Stadium. Its enclosed outer shell is shaped to resemble a diamond, highly reflective during the day and illuminated with thousands of diodes in the night. It was even called “the Diamond of the Desert” by Qatari organisers, but location in north-western Doha is hardly deserted. Quite the opposite, because the stadium is expected to be surrounded with one of the greenest areas of the city. The angular shell is also closely associated to geometric patterns seen commonly in Arab architecture. With partially perforated cladding it will also provide sufficient control of temperatures inside, enabling to maintain 24-28 degrees no matter the weather. At the same time photovoltaic panels will be embedded into the cladding, providing up to 20% of matchday power demand. On non-event days the stadium will supply nearby facilities with electricity. And those will be quite numerous. The landscaped complex will include gymnasiums, clinics, an aquatics centre and facilities for racquet sports, cycling and rock climbing. Even indoor surfing and skydiving will be available. The stadium’s stands will hold roughly 40,000 people inside during the 2022 World Cup and 25,000 in legacy mode. Majority of the uppermost tier will be dismantled and – as promised back in 2010 – distributed among developing countries where it would serve as separate grandstands. While many newly-released features sound impressively and the looks make a similar impression, the stadium hasn’t changed that much since the 2010 winning bid. In fact, so far it’s the only one out of four presented final concepts that retained so much from the initial idea. Already when created by Tim Hupe architects in Germany, the stadium resembled a gem with its reflective outer coat. Since 2010 a lot has changed and evolution included analysis of potential athletic track inclusion (eventually dropped) or considerations of dynamically illuminated roof, also not included in the final design. But the Fenwick Iribarren stadium still holds on to what was the first idea: diamond-shaped stadium in Education City. And seeing enabling works underway, we should expect it to stay that way.